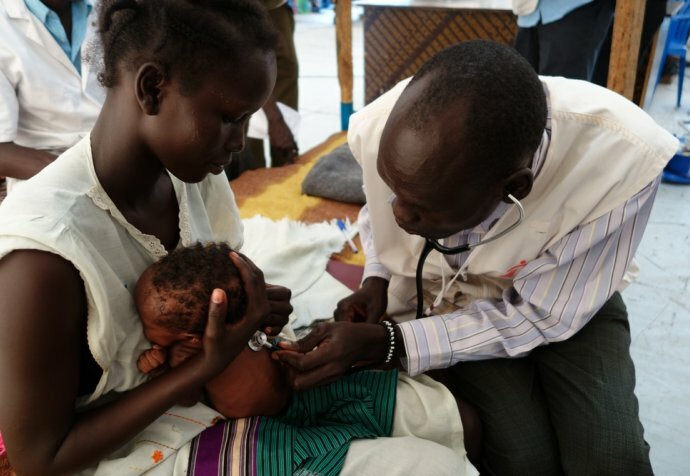 The Malakal Protection of Civilian site (PoC) was created at the beginning of 2014 to offer temporary protection to the population of the area who were caught up in fighting in South Sudan´s Upper Nile. But, four years on, the difficult living conditions, the loss of hope, feelings of enclosure as well as limited livelihood opportunities have had an effect on the mental health of those who are trapped inside. For most, leaving the site is not yet an option. In the corner of the main ward a young woman suddenly falls to the ground shaking uncontrollably. Immediately the hospital´s staff rush to her side to prevent her from harming herself. A nurse pulls a screen across to offer some privacy. In 2017, there were 31 attempted and seven successful suicides. At the end of the year there was a spike of 10 attempted suicides in one month. 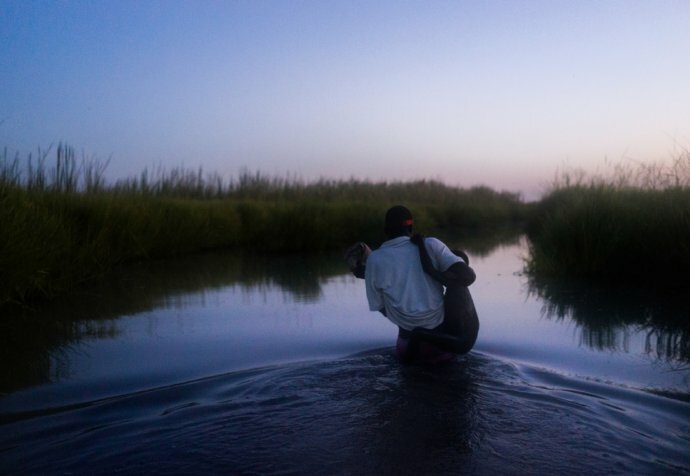 "For many people the anxieties and stresses of being trapped in the PoC are beyond what they can cope with"
The PoC was founded in 2014 after fighting in Malakal forced many people to flee their homes. The priority of the United Nations Forces in South Sudan (UNMISS) that founded the camp was to secure a space where people could settle temporarily. Improving the living standards in the camp was not an immediate priority. But as the years passed, the camp´s authorities realised that the PoC was not going away anytime soon. There is a drive to slowly improve conditions, but options are limited. There are now 25,000 people living in a very confined space, the majority of whom are children. In some parts of the camp, the average living space is less than 17 metres per person. The most difficult time in the camp is the rainy season, between June and October, when the black cotton soil in the camp turns to a thick mud and the packed-earth floors of people’s huts turn to puddles. “Given the violence that people have lived through, many would be expected to suffered from post-traumatic stress disorder. But I see a different picture,” says Dr Ramakrishnan. "It is hard to say exactly the proportion of people with mental health issues in the PoC, but we receive between 18-20 new serious mental disorders a month"
The psychoses push people into a mental prison, separating them from the real world. Solitary individuals can be seen walking around in a daze as they struggle to deal with the situation. Due to separation, many have no families for emotional support. It is hard to say exactly the proportion of people with mental health issues in the PoC, but we receive between 18-20 new serious mental disorders a month. This does not include those that go unnoticed or who are not be seeking treatment for other mental issues. the Mental Health Practitioners in South Sudan Working Group, which helps coordinates activities, found that in from 2017 found that close to half of all mental health cases were related to depression and 15 percent to anxiety. The threat of violence is an ever-present factor and adds to the tension. In February 2016, 25 people lost their lives when fighting erupted in the PoC. Many more were gravely injured and one-third of the camp was consumed by fire. Some try to find solace in marisa, a local alcohol distilled from sorghum. Alcoholism is rife in the camp and contributes to health problems such as hypertension and lower natural resistance to conditions like tuberculosis. While the routine of family life may help some women, they also have the constant fear of sexual violence hanging over them when they leave the safety of the camp. One of the few sources of livelihood for women is collecting firewood outside the gates of the camp. "The threat of violence is an ever-present factor and adds to the tension"
Childhood ends early in the PoC. During the second half of 2016, a number of cases of attempted and actual suicide attempts among children grabbed the attention of the camp´s authorities and led to renewed action. Unfortunately, the plight of children often goes unnoticed. Within families signs of emotional distress, like aggression or bedwetting, are inadvertently dismissed by parents. Abuse, neglect and hunger can go unnoticed and lead to behavioural change. Neglected children and orphans can be s on the streets, sometimes eating garbage as they have no food rations. Again, alcohol is often the only identified means of escape and can lead to violent behaviour. “With cognitive behaviour therapy, we can help develop peoples’ coping skills when they are suffering from conditions such as depression which eventually helps them identify mental triggers to depression and find mitigation strategies,” says Natalia Rodriguez. In the meantime, the camp authorities will need to do more than provide food and water. They must also confront the lack of sufficient housing, develop strategies for greater engagement among the community, and create more opportunities for employment in the camp. At this moment the psychiatric and psychological resources in the camp are insufficient for such a large vulnerable population.